"These towers, by the way, are many in number, and peculiar interest is attached to some of them. The chief one is called Fiennes, or the Constable's Tower, a noble specimen of Norman architecture, which, it is said, owes its erection to the time of William the Conqueror; and not far away are six or eight towers built during the reign of King John, who married 'the shrinking maid of Angouleme' in the chapel in the Castle, still called after him who, though faithless, was yet hedged by the divinity which is the fortunate attribute of both good and bad kings. 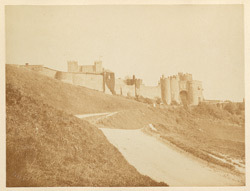 Then there is the tower built by and named after Earl Godwyne, the first Constable of Dover Castle and Lord Warden of the Cinque Ports, who died in 1053; and, continuing his exploration, the visitor will be able to walk among the bastions, the casemates, the under-ground works, and inspect the Saxon fortifications, glance at the famous 'Pocket Pistol' of Queen Elizabeth...and next he will perhaps ascend the Keep, erected during the reign of Henry the Third, in whose sovereignty there were thirty-three 'Constables.' From here a splendid view of the Castle, Dover, its fortifications, a large portion of the County of Kent, and especially of the sea-coast, is obtained."